War, war never changes and it appears the Planet of the Apes movies don’t either as the most recent in the rebooted trilogy, War for the Planet of the Apes, is just as excellent as those that came before it. Set a decade after the events of Dawn of the Planet of the Apes the film sees ape messiah Caesar (Andy Serkis) desperately trying to protect his tribe from the remnants of the U.S Army. He’s got his work cut our for him though as the apes have never faced a foe quite as well-armed, ruthless and downright dangerous as Woody Harrelson’s Colonel, a deranged army officer who wants to wipe out the evolved apes. 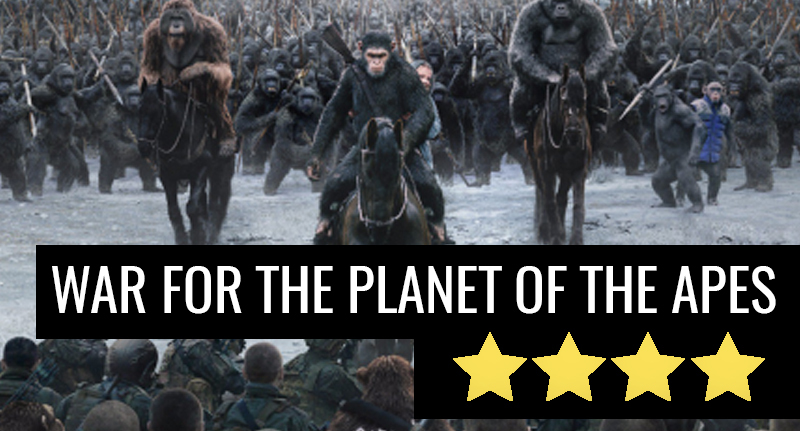 War for the Planet of the Apes is a wonderful film full of action, intrigue and suspense, successfully transposing the focus away from the human characters and on to the Apes as they finally inherent both the planet and the role of the film’s principal leads. Everything we see is from the ape’s perspective, leading to some of the film’s greatest moments as the terrifying reality of humanity’s desire and the levels they’ll stoop to to survive becomes apparent to out hairy heroes. War is a seriously dark picture which perfectly captures the gruesomeness of war like some bizarre combination of Apocalypse Now and Monkey Business. It isn’t all grey misery though, the newest addition to the ape’s posse, ‘Bad Ape’ (Steve Zahn), brings some much needed levity to proceedings providing some respite from the bleakness of the fighting. 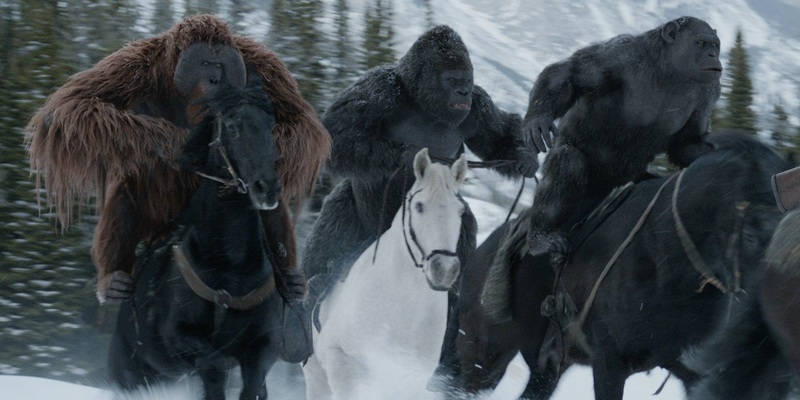 Of course you can’t talk about a Planet of the Apes movie without addressing the fact that all the characters are CGI and it”s a testament to how far we’ve come in visual effects that there wasn’t one second in this film where I questioned the apes in this film. They were both realistic and surprisingly human, especially Caesar who’s played with aplomb by Andy Serkis who should (but probably won’t) receive Academy attention for his pioneering performance capture work. Harrelson provides a fantastic performance as well giving the Colonel, who could have so easily become 2D villain of the week style-antagonist, real depth and range beyond the usual ‘you killed my [insert family member here] prepare to die’. Unfortunately War isn’t a perfect movie, like so many recent pictures it’s ever so slightly long and the whole Caesar being the ape messiah is a bit on the nose, especially when he’s literally crucified. Of the current ‘franchise blockbusters’ out in cinemas right now though Apes ranks highly, probably just a smidgen behind Spider-Man: Homecoming, and is well worth a trip to the cinema.